Jane is a dancer and performance maker with a love for connecting people with the dancer in themselves and the possibilities revealed in movement. Her dance training began at the age of 8 with Aina Reega Ballet and continued at the Bodenweiser Dance Centre, then into dance improvisation and a Graduate Diploma in Movement and Dance from Melbourne University. 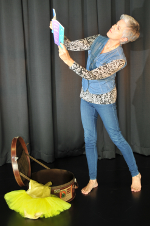 Jane is Artistic Director of Somebody’s Aunt, improvising women creating dance in the Canberra region since 2005. Jane has been teaching and choreographing dance with Canberra Dance Theatre since 2006, including Existence, part of Life is a Work of Art at the National Gallery of Australia and is a Co-Director of the GOLD Company. At CDT Jane started the Parents, Tinies and Toddlers class and founded CDTeens. Since 2014 Jane has been teaching dance for people living with Parkinson’s, enabling opportunities and performance. Jane has also developed and conducted courses using movement in learning about group dynamics, communication and body image issues.